The emerald is a variety of the silicate mineral 'beryl' and owes its colour green to chrome and vanadium ions. If one looks at this precious stone and does not become a slave to the deep green immediately, it is probably no genuine emerald. As its colour is extremely pleasant to the eye and the favourite colour of most people is green, as has been proved, the effect of the desire is practically unavoidable! Since the antiquity emeralds are highly estimated as gemstones. Colombian specimens achieve on account of their exceedingly strong colour often even higher prices than diamonds. An emerald with the unbelievable weight of 57,500 carats was mined in Latin America and was sharpened in India. The ‚Teodora‘, or also called ‚God’s present‘, is a legend long since and is probably still offered to purchase. Emeralds of wearable dimensions are suited wonderfully as a solitary eye-catcher in antique pendants and necklaces. 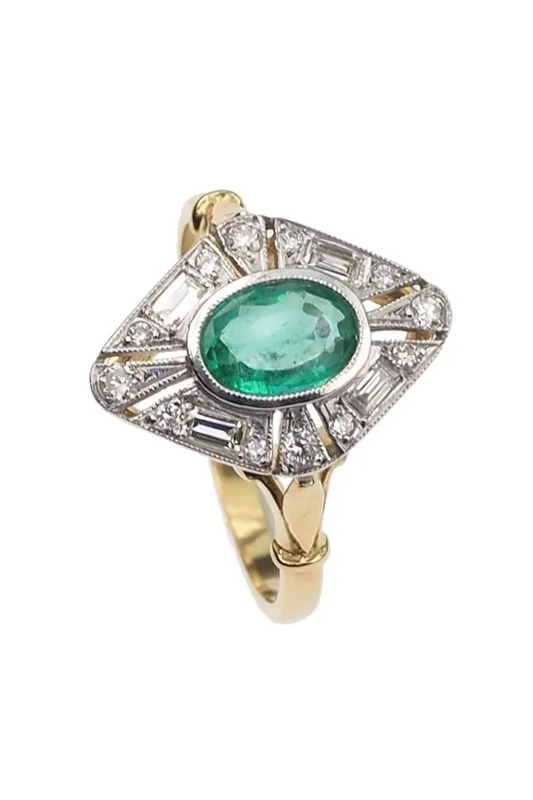 But also emeralds set around with diamonds in extremely tasteful engagement rings from the Art déco epoch are desirable pieces of antique jewellery.